Dale Morris, Jr. began playing violin at age three. By the time he was ten years old, he began his professional career performing with the Bar-D Wranglers at the Bar-D Chuck Wagon Supper and Western Show in Durango Colorado. He performed there for the next three summers alongside his father, Dale Morris, Sr. As a teenager, he competed in many fiddle contests, winning numerous championships in the United States, including the Texas State Championship, Grand National Title and the Grand Masters Championship. Upon graduation from high school, he went to college on a music scholarship and performed with the jazz band at Weatherford College, in Weatherford, Texas. In 1987, Dale went to work in Branson, Missouri, with the World’s Favorite Hobo, Boxcar Willie. He would spend the next three years with Box performing at his theatre, as well as touring the United States and Europe. A few years later he began working with Marty Stuart and The Hot Hillbilly Band touring the United States and Canada. In 1992, Dale was part of the No Hats Tour with Travis Tritt. He then took a brief hiatus from the road and worked at Cowboys Night Club in Dallas, Texas, for the next six years. In 2001, he started touring with country music legend, Ray Price. Thus far his work with Ray has led to numerous television appearances and tours with Merle Haggard and Willie Nelson as part of the Last of The Breed Tour. At present, Dale is teaching workshops and master classes around the nation. He has been teaching for over 30 years. In addition to violin, he also teaches guitar and mandolin. He is in constant demand for live performances as well as studio work. Dale has played commercial jingles for Miller beer, Justin boots, TDMV and many more. He has also recorded with many artists including Charley Pride, John Mayall, Marty Stuart, Ray Price, Bob Wills Texas Playboys, Chuck Rainey and a host of other artists. His latest CD is titled, First Noel, which is a collection of Christmas songs he arranged and played in a whole new way. It is a mix of Jazz, Swing, Country and Folk music. It is not your average run-of-the-mill Christmas music! Dale is currently working on two new CD projects due to be released in 2012. Come see Dale perform at a city near you and experience the magic of this world-renowned artist! Dale Morris Jr. was born November 13, 1965, in Ft. Worth, Texas, to Dale Morris Sr. and the late Anita J. Hardgrave. He currently resides in Ft. Worth, Texas. He began playing fiddle at the age of three with his earliest influence being his dad. They would attend jam sessions at the homes of Werner Cain or Bill Gilbert, the best fiddlers around would attend. With these jam sessions Dale considers himself self-taught, learning from tape recordings and vinyl LP’s, never having formal lessons. Dale grew up around the contest circuit influenced by Benny Thomasson, Orville Burns, The Solomons, The Franklins, Joe Venuti, Keith Coleman, Buddy Spicher, Tommy Jackson, and a few others. He attended the Fiddlers’ Frolics for the first time at the age of six and remembers the encouragement given by Cliff and Velda Fryer in his early contest years. 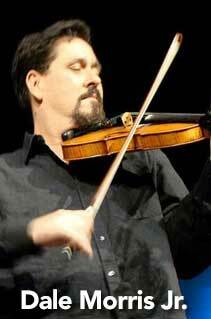 Dale has competed in many fiddling contests, winning numerous championships; including the Texas State Championship, Grand National title, as well as the Grand Master Fiddle Championship. Dale treasures the opportunity he had being around Benny Thomasson, in the early 1980’s, when Benny moved back to Texas from Washington State. Benny is probably his biggest influence in contest fiddling. Dale’s uncle, Terry Morris, was also a big inspiration to him. In Dale’s own words, “Terry certainly raised the bar for all of us in the fiddle world.” Dale also remembers a day he got to spend in Oklahoma City, Oklahoma, with Orville Burns in 1999, “What a treat that was! We went and picked him up at the nursing home, then went to his son, Orville Jr.’s home and fiddled the rest of the day.” By the time Dale was ten years old, he began his professional career performing with the Bar-D Wranglers, at the Bar-D Chuckwagon Suppers and Western Show in Durango, Colorado. He performed there for the next three summers alongside his father. Upon graduation from high school, Dale went to college on a music scholarship and performed with the jazz band at Weatherford College in Weatherford, Texas. In 1987, Dale went to work in Branson, Missouri, with The World’s Favorite Hobo, Boxcar Willie. He would spend the next three years with Boxcar performing at his theatre, as well as touring the United States and Europe. A few years later he began working with Marty Stuart and The Hot Hillbilly Band touring the US and Canada. In 1991, Dale was part of the No Hats Tour with Travis Tritt. He then took a brief hiatus from the road and worked at the Cowboys Night Club in Dallas, Texas, for the next six years. In 2001, he started touring with country music legend, Ray Price. Thus far his work with Ray has led to numerous television appearances and tours with Merle Haggard and Willie Nelson as part of the Last of The Breed Tour. His music has appeared on motion picture soundtracks, television jingles, and music videos. Dale is a highly sought after studio musician and has recorded with such artists as Charley Pride, Deryl Dodd, John Mayall, Bob Wills Texas Playboys, Ray Price, Marty Stuart, Chuck Rainey, and many others. In addition to his studio work, Dale teaches at workshops, seminars, and private lessons. He also enjoys judging fiddle contests around the country. Dale is an avid musical instrument historian with a passion for vintage instruments. Dale is extremely proud of his four children Marcus, Michael, Shaun, and Allison, who are all musically inclined and will carry on the family tradition.